1. Tomatoes cut in half, spoon carefully remove seredtsevinu and grind it. 2. ham cut into small slices, onion — thin slices, chop the garlic. 3. Mix the tomato pulp with cheese, add the ham, onion, garlic and 3 tbsp. l. crackers. Season with salt and pepper and mix well. 4. 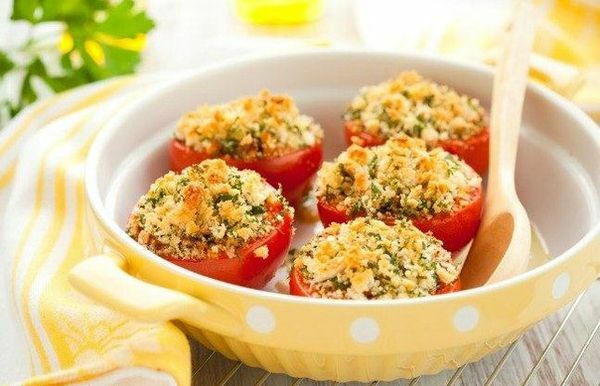 Get the meat to dump half of tomatoes, sprinkle with remaining breadcrumbs, thyme leaves, sprinkle with oil and place in a preheated 190 ° C for 25-30 minutes.